Century High School students showed attendees what contributions they can expect from young people in the future. 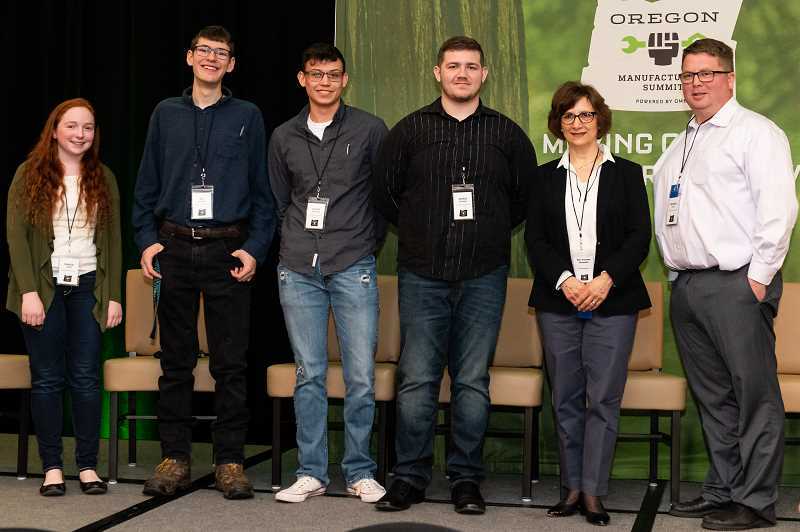 If today's high school students are any indication of what the manufacturing industry of tomorrow might look like in Oregon then the industry as a whole is in for a pretty bright feature. That was the takeaway from Friday's annual Oregon Manufacturers' Summit held at the Embassy Suites in Tigard, which attracted more than 300 attendees who heard from industry leaders and listened to the successes involving the state's 5,000 manufacturing companies. Following an introduction from U.S. Rep. Suzanne Bonamici, who despite a recognition that there is a skills gap for those seeking employees for manufacturing jobs, noted that "there's a bright future" in manufacturing. 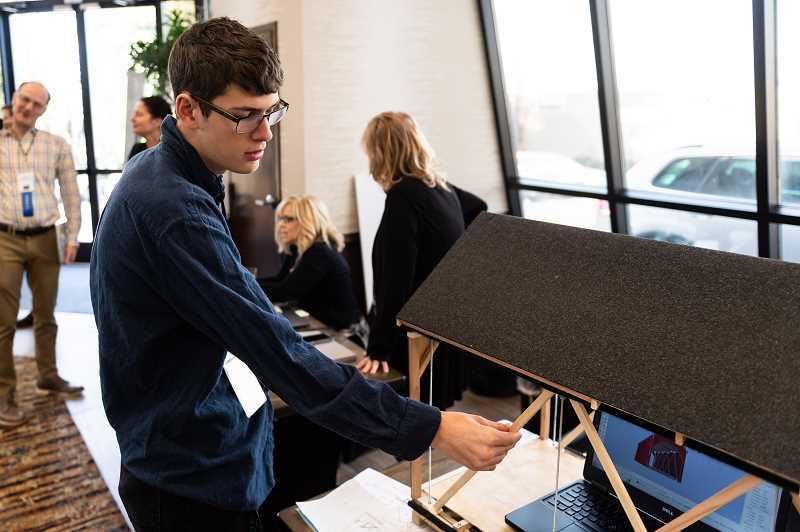 Take the students from Hillsboro's Century High School — Ben Fryback, Natalie Jones, Austin Ramsay and Austin Van't Hul, all part of the school's Drafting Technology classes — as examples of that bright future. 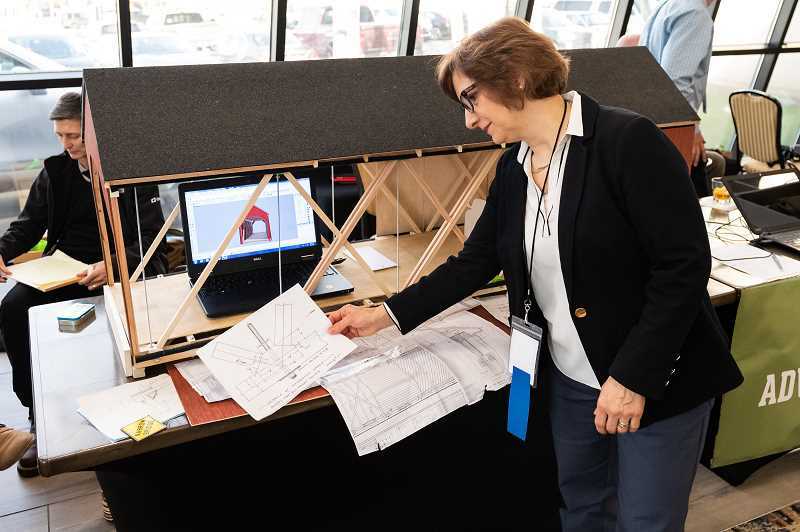 For his part, Fryback brought a model of the 1:12 scale covered bridge he constructed using the school's 3D printer, a CNC router, laser cutter and other high-tech tools. The bridge comes from maps from a covered bridge in Newfoundland (after Fryback was unable to convince Portland officials to give him blueprints for the Markum Bridge). "If you were to build a covered bridge in 1950 Canada, this is what you would build," Fryback, a senior, said of his model constructed mostly of wood. The other students weighed in on projects and passions they're involved with as well. Wood, a junior, said she's been involved with manufacturing classes at Century for two years and especially loves working with the CNC router and laser engraver. She plans on going on to study industrial design and business. Meanwhile, Ramsay, a senior, said last year he made an estimated 100 Christmas ornaments carved out of crystal, using the school's laser cutter. He sold them for $10 each, giving profits to the Northwest Educational Service District. Last but not least, Van't Hul, also a senior, said his passion is designing and printing elaborate posters. He's also taking a former plywood train table and transforming it into a board game table to include such popular activities as Monopoly and Sorry. Oh, and on the side he's working on building a potato gun. Matt Loun, a math teacher who heads up the drafting classes at Century (courses he said should be renamed advanced manufacturing classes to more accurately reflect what they entail), said his school now boasts between 25 to 30 3D printers thanks to a Certified Technology Education revitalization grant from the state of Oregon. Meanwhile, Michael Vanier, vice president of client engagement for the Oregon Manufacturing Extension Partnership (or OMEP), which presented the Oregon Manufacturers' Summit, said he was pleased with Friday's turnout. "It's a great mix of industry partners, current clients and (us) reaching new manufacturers," he said. The morning began with a keynote address by Andrew Barofsky, president and CEO of RevMedx, who spoke about the life-saving medical products his company manufactures for U.S. military combat medics and civilian paramedics to treat bleeding in trauma situations. Vanier said a great example of how beneficial the summit can be came from praise he said was made by Andrea Wade, founder of Honeybee Sparkling Lemonades & Syrups. Vanier said she told him she had no idea that resources such as those provided by the partnership and the summit were available for small businesses such as her's. Vanier said Wade's business is a true success story of how small emerging companies are successfully entering the market in Oregon. Already, Honeybee occupies shelf space in both Market of Choice and New Seasons. The summit, whose theme was "Moving NW Manufacturing Forward," was also a good way for manufacturers throughout the state to make connections with one another, said organizers. Statistics of interest to manufacturers came from Jennifer Campbell of Schwabe, Williamson and Wyatt, who reviewed a survey entitled "State of Manufacturing in the Pacific Northwest." Among the highlights from those manufacturers polled in Oregon (and a smaller number from Washington) was that improving its workforce was the top challenge overall for companies. The other priority is finding talent in a tight employment market with Campbell pointing out that of those surveyed, 72 percent said their challenge is a lack of skilled workers. And how are manufacturers trying to solve those problems? "It's a combination of internal and external strategies," said Campbell, noting that 27 percent believe that can be accomplished by creating or expanding apprenticeship programs with 26 percent believing that offering flexible work schedules would be beneficial. Finally, Campbell stressed the importance of having a transition of executive leadership plan in place, something that 41 percent have in place and 35 percent whom are developing such a plan. Back in a foyer at Embassy Suites, Fryback, the student who hopes to someday become a traffic engineer who designs highways, railways and bridges, talked about how he put his 63-inch bridge together. Asked what he thought about his students' accomplishments at Century, instructor Loun responded: "They're rock stars."